Which Hollywood star owns a tank? Of all the famous celebrities in the world, it could only be Arnold Schwarzenegger who owns his hos very own tank. Such a macho guy couldn’t possibly own anything else! Although he has admitted that he absolutely loves to crush things, it’s more than a toy for smashing up old cars and joy rides. The tank he owns has a highly personal meaning for him. The tank that Arnie owns is a M47 Patton. This type of tank was produced in the early 1950s and are still in service more than half a century later. Weighing 50 tons, the tank is a colossal example of military prowess and as it’s the very tank Arnie first drove when serving in the Austrian Army, it has sentimental value. Schwarzenegger enjoyed his military service, having recounted tales of manoeuvres that would last for weeks at a time. He has recalled how he would dig a trench to roll his tank over and he and his crew would sleep in the dirt underneath. He even stored his weightlifting equipment in a tool compartment on the side of the tank! This dedication to training, even when away from base meant that within a few months of leaving service, he was in good enough shape to compete in his fist Mr Universe contest in 1966. He won silver in that year. Not bad for his first attempt. Schwarzenegger bought the tank back in 1992, bringing it to the U.S to be staged in a Planet Hollywood in Las Vegas. When this plan didn’t work out, he decided to keep the tank at the Melody Ranch Motion Picture Studio, not far from Los Angeles. Melody Ranch has appeared in many old and current Western movies, including most recently, Django Unchained. The ranch is also home to a collection of military vehicles seen in many different movies over the years. 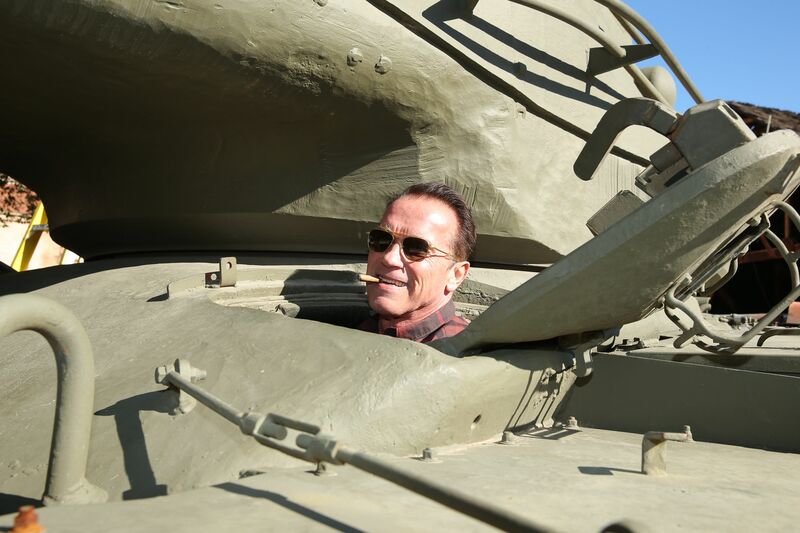 Arnie uses the tank for more than just crushing things and having fun. He has used it as part of his foundation to help inner city kids stay off the streets and in school. After-school programs across America invite student groups to visit the ranch and take rides in the tank with him. Yes, he might almost as old as the tank but there’s plenty of spirit and life left in the pair of them!